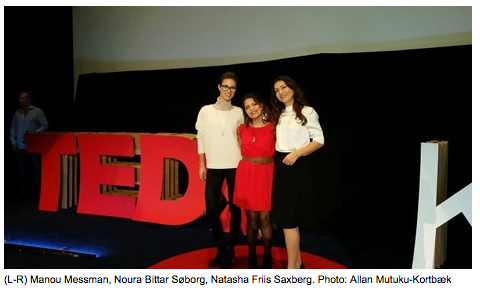 Denmark’s First University TEDx Inspires & Educates | Mutuk5. The TEDx concept was brought to the Copenhagen School of Design and Technology this week, marking the first university franchise event in Denmark. Technology, Entertainment, Design; TED – an acronym that many readers are no doubt familiar with. Founded in 1984, the TED brand operates on the maxim “ideas worth sharing” and usually consists of elaborate, well -prepared talks that are often filmed and unleashed to an eager online public. A powerful communication platform, it has branched off into numerous worldwide franchises operating under the TEDx banner, with the “X” denoting events that fit under the TED umbrella but are independently organized. TEDx KEA, Scandinavia’s first ever university TEDx franchise, brought a wave of inspiration and knowledge to the city on Thursday at the Nørrebro campus of the Copenhagen School of Design and Technology (KEA). Featuring a main event at the adjacent Empire cinema and a live stream inside the campus (and to a worldwide audience) TEDx KEA ‘Emerge’ aimed to unite businesses and local leaders in the fight for a better tomorrow, provoked and emboldened by the up and coming talent of our generation. Within this frame, speakers ranging from industry heavyweights such as author and serial entrepreneur Lars Tvede to Syrian refugee and women’s rights activist Noura Bittar Søborg gave TED talks that touched on a broad spectrum of topics. The latter received a standing ovation at the end of a compelling talk that told the epic tale of a struggle against violence in a war-torn nation, proposing a change to the status quo with verve and indefatigable emotion. Others took a less serious, albeit compelling form – as was the case with sports marketing guru Stefan Pflug, who decried the short attention spans of internet-based information consumption. From fashion psychology (Manou Messman) to the need for a better understanding of social entrepreneurship (Lars Hulgård), each of the ten talks given during the course of the day told a personal story that merged with a call to arms within various subject material, asking questions of the manner in which we as a society operate. For franchise holder Doug Costello and a massive crew involved in everything from speaker scouting to live stream recording and rhetorical training, the day represented the culmination of many months of hard work and a learning experience for future events of the same kind under the TEDx KEA banner. The ten talks from the day will be edited and put online at some point, in itself a demanding task, but one that prolongs its longevity as a source of knowledge and inspiration for years to come.